Last Year I was unable to attend the Indian rally in Finland, so I did a solo trip to the North Cape instead. 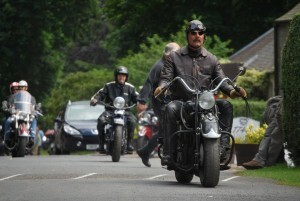 It was a great trip and a good roadtest before the Indian rally in Scotland last Year. The trip to Scotland were originally planned to go via the Faroe Islands to Scrabster in northern Scotland, but as the ferry connections were badly reduced, we ended up on a Cargo Ship sailing from Gothenburg,Sweden to Immingham, England. Since this was Eva’s first long motorcycle trip, a sidecar was mounted. After several problems over the last few weeks, we were finally ready to catch the ferry going to Sweden. Due to the problems, the bike and departure was a bit unprepared. Well, I guess the Vikings back in the old days were somewhat unprepared for their vikingship adventures also. We arrived at the Cargo ship docks in Gothenburg, after some hours riding in the rain. And since Cargo ships don’t departure until they are fully loaded, we spent several hours waiting outside in the rain. Late at night the following day, we finally arrived at the Immingham docks. Now riding on the “wrong” side of the road, with the sidecar facing the traffic! From Holyhead we took the Irish Sea Ferry to Dublin, Ireland, and after some navigational problems we eventually found the Red Cow Hotel. There we met up with a whole bunch of Australian riders and Katarina and Jørgen Sundberg from Sweden. We had not told anyone that we were coming, but within10 minutes the bike and equipment were all placed indoors together with the other bikes. The next morning the group travelled towards Belfast, while Eva and I spent most of the day sightseeing in Dublin. Late at night we arrived in Belfast, after a quite wet ride. Well, in true biker fashion it was barely enough time to put on some dry clothes and find the pub! The next day the plan was to ride to the top of Northern Ireland, visiting the Giant’s Causeway and steep cliffs. We got stuck on the parking lot outside the hotel, because of a headgasket leak on the old Chief Bluesmoke. Finally after some hours we headed out for an easy ride up along the east coast. Northern Ireland was a pleasant surprise with its beautiful scenery. However, we noticed that the differences from the past was still quite visible. At night we walked around downtown Belfast, and the city showed a good mixture of old wealth and craters from the IRA car bombs. The next morning we got up early to make it to the ferry to Stranraer, Scotland in time. We were now a part of the Australian gang, and the Chief Bluesmoke was decorated with a Kangaroo flag and tiny Koalas. Starting 20 Indians in Belfast at 0630 in the morning was an experience, luckily we managed to ride off before the antiterrorist police woke up. 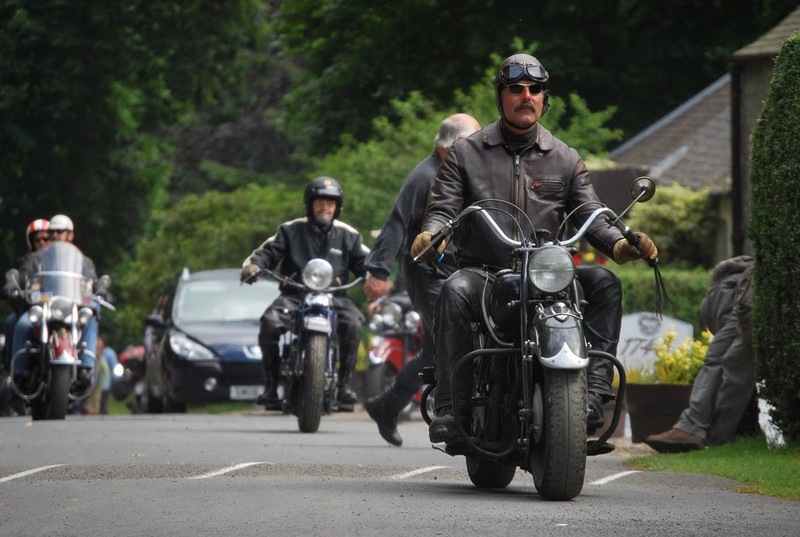 In Stranraer we met up with John Wright from the English Indian motorcycle club, and he took us on a ride on narrow roads towards the rally site for “Old Indians never die rally”. There were already quite a few bikes and people at the campsite when the Australian group rode in. An International Indian rally is all about mingling and off course the Indians. There were some issues related to the dining, and not everyone is up to rock and metal music like myself. But it was a very good weekend, despite the rain and blocked toilets. The rally took place at the field next to Traquair House, the oldest inhabited house in England. 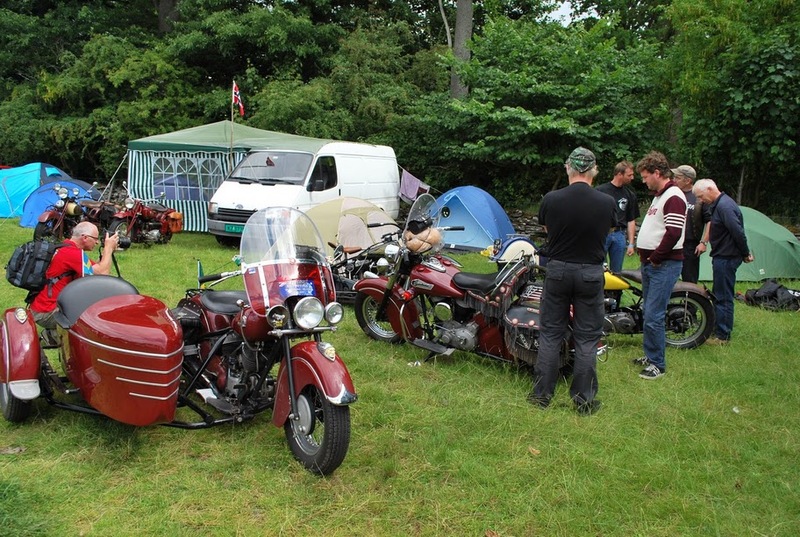 A few of the European dealers were present at the campsite. And they even had official Indian rally beer which was made at Traquair. On the Saturday there was a trip to a nearby Distillery, after a photo shoot in front of Traquair House. Unfortunately we broke the sidecar wheel and had to send the sidecar back with the follow car. Well, need more time to prepare the bike next time. On our way back we also picked up some other defect bikes. At night there were various shows on the stage and the rally ended with fireworks formed as an Indian logo. The next day was the first day of the Scottish Highland Tour, arranged by Alan Forbes. 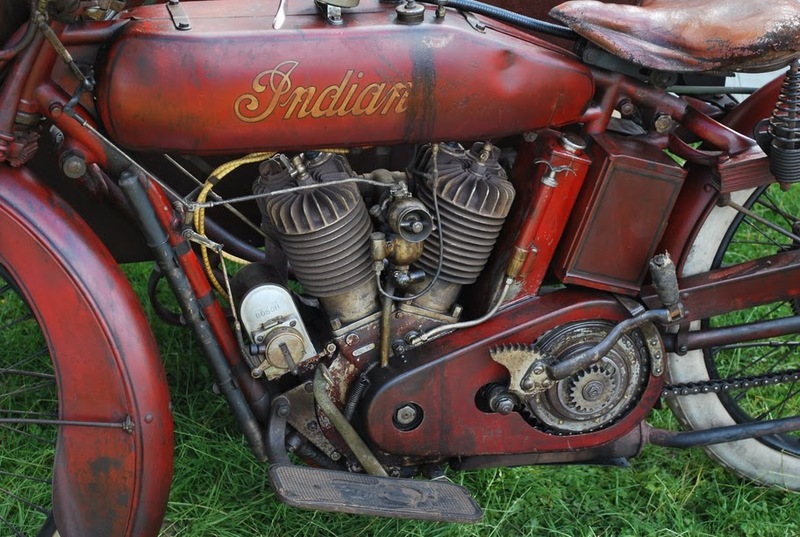 We installed a chummee seat and some extra foot rests on the Indian. Again we joined the ever growing Australian group. This Australians were very well organized with marshals that stayed at each corner, waiting for the last motorcycle to take the right turn. This way we hardly lost any bikes along the route. All the way in the back were the follow cars that had tools, luggage and room for bikes. The first night on the tour was spent in Aberfeldy, a cozy but sleepy little town north of Edinburgh. As a part of the tour we got daily lunches with sandwiches and drinks, which were greatly appreciated. From Aberfeldy we rode to Fort Augustus, near the Loch Ness. Here we found a pub with great live music, and the noise level got loud with a bunch of Indian riders present. It turned out to be a good night for the musician and bartenders. At noon we rode towards Glenelg. To go to Glenelg, one must first ride to the Isle of Skye and then cross some heavy streams with a tiny car ferry. Glenelg was great, and the local community hosted us in their town hall for the night. We finally experienced a bagpipe show, and a whole roasted pig was on the evening menu. Due to lack of capacity on the ferry from Glenelg and the following ferry from Isle of Skye, we had to divide the group in several departures. We ended up in the last departing group and took a ride along the west coast of the Isle of Skye. Excellent! We are spoiled with beautiful scenery in Norway, but Scotland has indeed a lot to offer with its great nature. We arrived at Glencoe late in the evening, and after riding around for a while trying to withdraw cash for paying the camping site, we ended up staying in a bed and breakfast. During the trip an oil leak had developed at the front cylinder base, but there was only time for tightening, then we had to hit the road again. 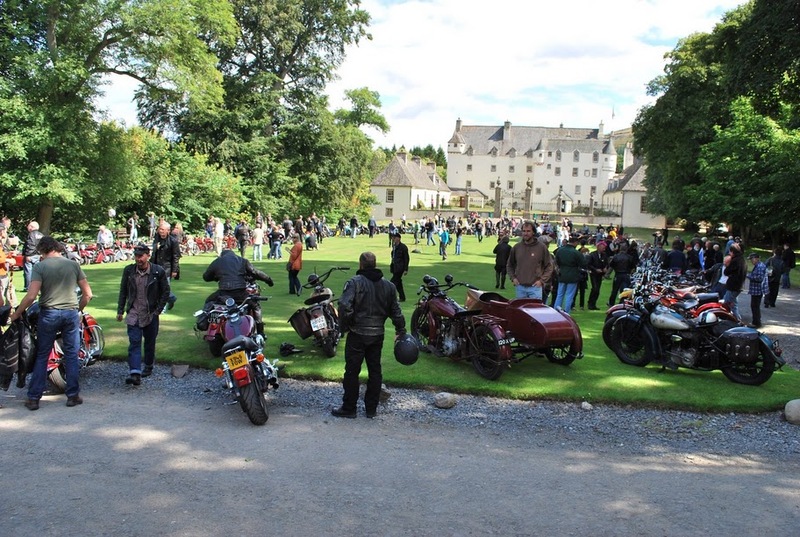 On the last day of the highland tour we rode back to Traquair house, where new parts for the sidecar wheel were waiting. The Australians rode directly to Whitley Bay. After the sidecar was mounted again, we rode off to Whitley Bay as well. The oil leak from the cylinder base gasket area was now getting worse, but we tried to make the last miles for Whitley Bay. Just across from the Scottish border the engine says bang and the trip ended there. The front cylinder base developed a crack, and the piston got stuck. We now had an extra inspection whole in front of the cylinder. Just perfect! We got stuck in a rural area with few houses around, so we called the insurance company which put us over to SOS International in Denmark. The rescue car was supposed to pick us up within 1-2 hours. So we just had to sit and wait in the cold rain. Most of our cloths and gear were in the follow up belonging to the Australians. After 3 hours the rescue car had still not showed up, and we called SOS International again. But for some stupid reason they could not pick us up since they needed an exact street address! Fortunately a couple from the local community, whom had passed us several times, stopped to give us food and drinks. Since we lost all confidence in the rescue team we got a ride to the nearest hotel a few miles away. Fortunately SOS International sorted thing up, and the next day we arrived Whitley Bay. Whitley Bay was an experience, though in a bizarre way. All the Indians were parked in a motor cycle hotel in the middle of the party street. The Indians drew a lot of attention from lightly dressed British girls, an even a “mankini” dressed drunk guy posed on one of the Indians. 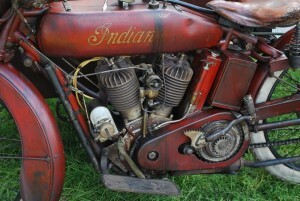 We had to leave the next day, and the Indian was taken to a storage awaiting shipment to Norway. Eva got a ride with the follow car to the tourist traps Whitby, Aidensfield and York. 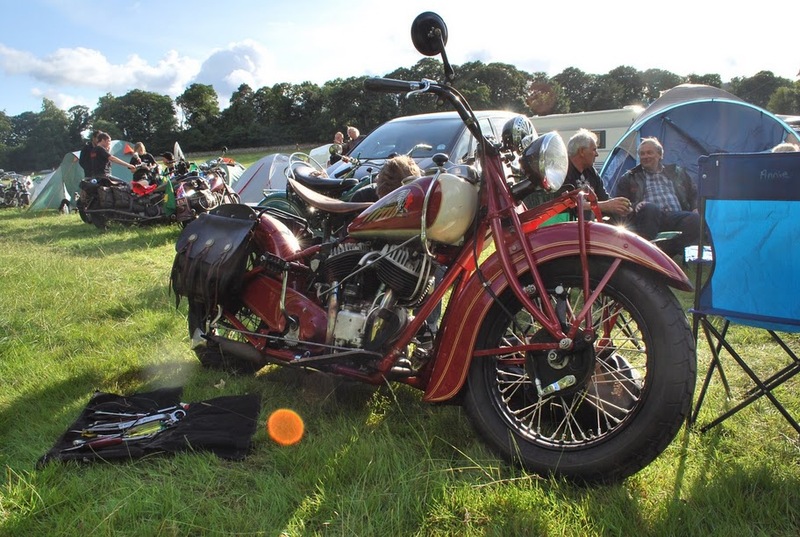 I got to borrow the rainbow Indian chief belonging to Indian dealer Gary Stark from California, as he wanted to do some sightseeing with his family while in England. It was a delight to ride such a quiet and smooth Indian, and fortunately it was also blue in color! The Australian group was heading over to Belgium to look for tombstones of Australian soldier from the First World War. Eva and I went to London and flew home the next day. Unfortunately we did not make it all the way home on two wheels, but we did get to see the best parts before the old Chief bluesmoke decided to blow up. 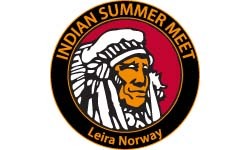 Next year it’s only a short ride to get to the International Indian rally at Leira, here in Norway! We’re looking forward to meet new and old Indian friends again. Thanks to the insurance company and SOS International the Chief Bluesmoke is back in Norway. The engine was out of the frame the day the bike arrived, and the inspection showed a casting error in the cylinder. A wall thickness of 1.3 mm, a heavy sidecar, a crazy Viking rider and the higher compression of the 84”, may have stressed the cylinder. No signs of piston seizing were detected. Later I discovered that the rod bearings are rusty and pitted due to water entering the crankcase during transportation. So the whole bottom end needs to be rebuilt before the 2010 riding season!